Registration failed: The Mac client cannot be assigned to the Configuration Manager site. Please verify that the Configuration Manager Proxy is running and that the boundaries are defined in the Configuration Manager console. 10-12 05:47:40.283 D /RegistrationAgent:75232:160b/ IsvProxySelector failed. Couldn't find local ISVProxy instance. 10-12 05:47:40.283 D /RegistrationAgent:75232:160b/ Registration failed: The Mac client cannot be assigned to the Configuration Manager site. 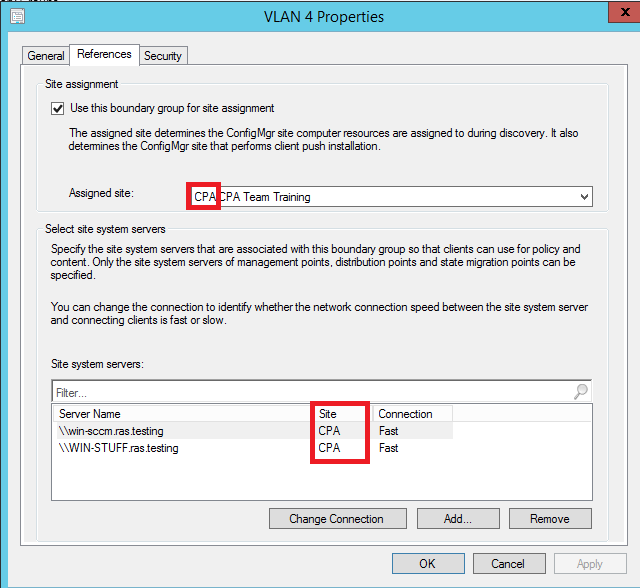 Please verify that the Configuration Manager Proxy is running and that the boundaries are defined in the Configuration Manager console. 10-11 14:47:39.960 D /pma_isv_proxy_service:17088:3e28/ Got site info for '10.0.29.232': site_code: "SCCM_SITE"
Make sure that there is no IP ranges overlapping in Boundary configuration (each boundary contains unique IP address range/subnet). In SCCM Console locate Boundary Group containing Boundaries for corresponding Mac(s) and open its Properties > References. In this particular case Site system server WIN-WSUS.RAS.TESTING must not be specified in any Boundary Group that is NOT assigned to Site CPA.